Inform the Police in a case referred which constitutes or may constitute a criminal offence against a child. The responsibility for undertaking Section 47 Enquiries lies with Children's Social Care in the local authority for the area in which the child lives or is found. Where the child's home address is in another authority (the 'home' authority), the 'host' authority has responsibility for undertaking enquiries e.g. alleged abuse on a school trip out of city / county. In this case, the child's 'home' authority should be informed as soon as possible and involved in Strategy Discussions / Meetings. It may sometimes be appropriate for the 'home' authority to undertake the necessary enquiries on behalf of the host authority e.g. in the case of a Looked After child. The home authority should take responsibility for further support of the child or family following the Section 47 Enquiry. Pass relevant information received by the Safeguarding Investigations Units relating to people under 18 to Children's Social Care. In dealing with alleged offences involving a child victim, the police should normally work in partnership with other agencies. Whilst the responsibility to instigate a criminal investigation rests with the police, they should consider the views expressed by the other agencies. Section 47 Enquiries should be initiated, usually following a Child and Family Assessment, or whenever the threshold criteria are met (see Threshold for Section 47 Enquiries). However, Section 47 Enquiries may be justified at the point of referral, during the early consideration of a referral, during an assessment such as Early Help Plan, Child in Need, or at any time in an open case when the threshold criteria are satisfied. A Child and Family Assessment is the means by which a Section 47 Enquiry is carried out. It should be led by a qualified and experienced social worker. A Child and Family Assessment, using the Assessment Framework, must be completed within a maximum of 45 working days. Children's Social Care is responsible for the co-ordination and completion of the assessment, drawing upon information provided by partner agencies. The Child and Family Assessment, under Section 47 of the Children Act, should begin by focusing primarily on information identified during the referral and Assessment and which appears most important in relation to the risk of Significant Harm. It should, however cover all relevant dimensions in the Assessment Framework, including any previous specialist assessments before its completion see Framework for the Assessment of Children in Need and their Families Procedure. Those making the enquiries should always be alert to the potential needs and safety of siblings, or other children in the household of the child in question. In addition, the Section 47 Enquiry may also need to cover children in other households, with whom the alleged offender may have had contact. A child's status - e.g. In Need, or 'at risk of Significant Harm' must be ascribed in a flexible manner, which recognises the possibility of change and a consequent need to re-ascribe that status. If at any point during assessment, the threshold for Section 47 Enquiries is reached, the procedures outlined in this chapter should be followed. Following an Emergency Protection Order or Police Protection. The Children's Social Care first line manager has the responsibility, on the basis of available information, to authorise a Section 47 Enquiry. In undertaking the necessary assessment of risk, the manager must consider both the probability of the event or concern in question and its actual or likely consequence. The impact on the child's health and development. A Section 47 Enquiry must always be commenced immediately there is a disclosure, allegation or evidence that a child is suffering or likely to suffer Significant Harm. This applies equally to new, re-referred and open cases. In making a final decision about whether the threshold for a Section 47 Enquiry is met, Children's Social Care must consult the Safeguarding Investigations Unit and other appropriate agencies so that relevant information can be taken into account. A decision to cease a Section 47 Enquiry should, after checks have been completed (and where relevant in consultation with the Safeguarding Investigations Unit and other involved agencies) be taken in a flexible manner when it is clear that the criteria for Section 47 are not satisfied. In these circumstances, consideration should still be given to completing the Child and Family Assessment. This decision must be authorised and recorded by a manager. If professionals are concerned about the decision made by Children's Social Care, they may wish to challenge it through using the Resolution of Professional Disagreements Procedure. Once a decision is made to initiate a Section 47 Enquiry, the first line Children's Social Care manager should ensure that the case is discussed with the Safeguarding Investigations Unit before a decision is made regarding whether a single agency or joint investigation should take place. The primary responsibility of the Safeguarding Investigations Unit staff is to undertake criminal investigations of suspected, alleged or actual crime. Children's Social Care has the statutory duty to make, or cause to be made, enquiries when circumstances defined in Section 47 of the Children Act 1989 exist. Where both agencies have responsibilities with respect to a child, they must cooperate to ensure the joint investigation (combining the process of a Section 47 Enquiry and a criminal investigation) is undertaken in the best interests of the child. This should be achieved primarily through coordination of activities at Strategy Discussions/Meetings). Generally there should be a presumption of a joint investigation unless agreed otherwise. If the agencies agree that a single agency enquiry or investigation is appropriate, there should still be an exchange of relevant information, possible involvement in Strategy Discussions and agreement reached as to the feedback required by the non-participating agency. Any decision to terminate enquiries must be communicated to the other agency for it to consider, and the rationale recorded by both agencies. The decision regarding single or joint agency investigations should be authorised and recorded by first line managers in both the Safeguarding Investigations Unit and Children's Social Care. Physical injury against a child under 18 constituting a criminal offence (includes murder, manslaughter, any assault involving actual or grievous bodily harm and repeated assaults involving minor injury). Child is Looked After by the local authority. Predisposing factors about the alleged perpetrator e.g. criminal conviction(s), history of violence, domestic abuse, substance misuse and / or mental health problems. There will be times when, after discussion or preliminary work, cases will be judged less serious and it will be agreed that the best interests of the child are served by a Children's Social Care-led intervention, rather than a joint investigation. In all cases the welfare of the child remains paramount and always takes precedence over the need to commence or conclude any criminal investigation. Indirect suspicions of Sexual Abuse, including over-sexualised behaviour of a child. Where a minor crime, initially agreed by the Safeguarding Investigations Unit as inappropriate of further police investigation, is subsequently discovered to be more serious than originally perceived, the case must be referred back to the Safeguarding Investigations Unit. Alleged offender is not known to the child or child's family i.e. stranger abuse - however in these circumstances, consideration will still be given to joint investigative interview(s) in accordance with Achieving Best Evidence. In all cases where the police undertake a single agency investigation, details of any victim aged under 18 must be referred to Children's Social Care, which is responsible for assessing if the investigation raises any Child Protection issues and if supportive or therapeutic services are appropriate. Where the police conduct a single agency investigation out of hours (because they have a duty to respond and take action to protect the child or obtain evidence), Children's Social Care must be informed immediately and, if appropriate, a joint investigation commenced. If there is any disagreement between the agencies about the need for a joint investigation or the 'seriousness' of alleged abuse, further discussion should occur between the line managers. If line managers disagree, the disputes should be resolved by agreement between senior managers from the agencies involved (see Resolution of Professional Disagreements Procedure). A note of the resolution must be recorded. A duty social worker or the allocated social worker will undertake the Section 47 Enquiry on an allocated case, in line with local arrangements. Contact the local Safeguarding Investigations Unit. Seeking permission is likely to impede a criminal investigation. The responsible manager should record the reasons for such a decision. See Information Sharing and Confidentiality for further discussion of the issues involved in information sharing. Even when there has been a recent Child and Family Assessment, agencies should be consulted and informed of the new information / referral. The checks should be undertaken directly with the involved professionals and not through messages with intermediaries. 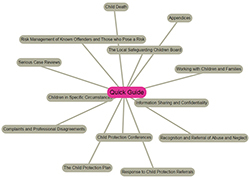 Agency checks should include accessing any relevant information that may be held in other local authorities, or abroad (see National Contacts for sources of information for children from abroad). In the course of a Section 47 Enquiry it may be necessary for Children's Social Care and/or the Police to make decisions or initiate actions to protect children, or require the parents to agree to such action. The Lead Social Worker must inform relevant agencies of any such decisions or actions and confirm them in writing without delay. The Lead Social Worker has the prime responsibility to engage with family members in order to assess the overall capacity of the family to safeguard the child, as well as ascertaining the facts of the situation causing concern. Be offered a verbal explanation of the child protection enquiry process; be provided with an explanatory leaflet. Due consideration must be given to the capacity of the parents to understand this information in a situation of significant anxiety and stress. Consideration must be given to those for whom English is not their first language or who may have a physical / sensory / learning disability and may need the services of an appropriate interpreter. It is also essential that factors such as race, culture, religion, gender and sexuality together with issues arising from disability and health are taken into account. It may be necessary to provide the information in stages and this must be taken into account in planning the enquiry. Parents should be provided with an early opportunity to explain their perception of the concerns, recognising that there may be alternative accounts and discrepancies. Exceptionally a joint enquiry/investigation team may need to speak to a suspected child victim without the knowledge of the parent or caregiver. Relevant circumstances would include the possibility that a child would be threatened or otherwise coerced into silence, a strong likelihood that important evidence would be destroyed or that the child in question did not wish the parent to be involved at that stage and is competent to make that decision. All children within the household must be directly communicated with during a Section 47 Enquiry. Those who are the focus of concern should always be seen and communicated with alone by the Lead Social Worker. The Record of Section 47 Enquiry should include the date(s) when the child was seen alone by the Lead Social Worker and, if not seen alone, who was present and the reasons for their presence. Interviewers do not have adequate knowledge and understanding of the child's racial religious and cultural background. Consideration should also be given to the gender of interviewers, particularly in cases of alleged Sexual Abuse. It may be necessary to seek information from the child in stages and this must be taken into account in planning the enquiry. Children may need time, and more than one opportunity, in order to develop sufficient trust to communicate any concerns they may have. The Strategy Discussion / Meeting must decide where, when and how the child(ren) should be seen and if a video interview is required. All subsequent events up to the time of any video interview must be fully recorded. The conduct of and criteria for visually recorded interviews with children are clearly laid out in the guidance Achieving Best Evidence in Criminal Proceedings. Agreement reached with the responsible manager as to what further action is required to locate and see the child and carry out the Section 47 Enquiry. If the parent/carer refuses to allow the Lead Social Worker to see the child alone and/or allows a discussion about the concerns the Lead Social Worker, in consultation with her/his manager, should have a Strategy Discussion with the police and seek legal advice as appropriate. In all cases the reason for not seeing the child alone should be recorded. Where the child appears in urgent need of medical attention (s)he should be taken to the nearest A&E Department e.g. suspected fractures, bleeding, loss of consciousness. In other circumstances the Strategy Discussion or Meeting will determine, in consultation with the paediatrician, the need and timing for a paediatric assessment. A paediatric assessment involves a holistic approach to the child and considers the child's wellbeing, including development, if under 5 years old and her/his cognitive ability if older (educational psychologists can offer further expertise). Provide treatment follow up and review for the child (any injury, infection, new symptoms including psychological). Only doctors may physically examine the whole child, but other staff should note any visible marks or injuries on a body map and document details in their recording. Recording a photographic image of any injuries should only be arranged and undertaken by the police, or as part of a paediatric assessment by a medical photographer. Professionals who receive a complaint of suspected non-accidental injury directly from a child should not photograph any injuries. The use of personal cameras or mobile phones for such a purpose raises the possibility of images getting lost, being posted online or being misused by potential perpetrators. If a child has chosen to take an image themselves of an injury the investigating social worker and police officer should be made aware, in order that the evidential significance of any image can be assessed by the police. *A child of any age who has sufficient understanding (generally to be assessed by the doctor with advice from others as required) to make a fully informed decision can provide lawful consent to all or part of a paediatric assessment or emergency treatment. *A young person aged 16 or 17 has an explicit right (Section 8 Family Law Reform Act 1969) to provide consent to surgical, medical or dental treatment and unless grounds exist for doubting her/his mental health, no further consent is required. Although a child of sufficient understanding (and who is subject of an Interim Supervision or Care Order, a Child Assessment Order, Emergency Protection Order or a full Supervision Order) may refuse some or all of the paediatric assessment, the High Court can (potentially) override such refusal by use of its inherent jurisdiction. Wherever possible, the permission of a parent should be sought for children under 16 prior to any paediatric assessment and/or other medical treatment. In non-emergency situations, when parental permission is not obtained, the Lead Social Worker and manager must consider whether it is in the child's best interests to seek a court order. Paediatric assessments are the responsibility of the consultant paediatrician, although an appropriately trained registrar or staff grade or exceptionally a police forensic medical examiner (FME) may conduct them. Referrals for child protection paediatric assessments from a social worker or a member of the Safeguarding Investigations Unit are made to the local paediatric service. The paediatrician may arrange to examine the child her/himself, or arrange for the child to be seen by a member of the paediatric team in the hospital or community. Where a paediatrician assessment is requested, prior to the assessment, the paediatrician should be briefed. Where an assessment is undertaken as part of a joint investigation, a Safeguarding Investigations Unit officer must directly brief the doctors and be present at the examination, and afterwards take possession of evidential items. Where paediatric assessment is undertaken as part of a single agency Section 47 Enquiry, this should be done by the social worker and the relevant Safeguarding Investigations Unit must be made aware. Child Sexual Abuse paediatric assessments should be undertaken in accordance with the guidance for paediatricians and FMEs issued by the Royal College of Paediatrics and Association of Police Surgeons Child Health Guidelines. Specific practical procedures may vary according to local arrangements. In cases of severe neglect, physical injury or penetrative sexual abuse, the assessment should be undertaken on the day of the referral, where compatible with the welfare of the child. Normally the order in which the paediatric assessment takes place (as part of the Section 47 Enquiry) will be decided at the Strategy Discussion. The need for a specialist assessment by an appropriate mental health professional should also be considered at the Strategy Discussion. The Lead Social Worker should (unless this would cause undue delay) consult parents about the gender of the medical practitioner prior to the examination being conducted. In planning the paediatric assessment, the Lead Social Worker, the manager responsible, the Safeguarding Investigations Unit and relevant doctor must consider whether it might be necessary to take photographic evidence for use in care or criminal proceedings. Where such arrangements are necessary, the child and parents must be informed and prepared and careful consideration given to the impact on the child. The paediatrician should supply a report or statement to the social worker, GP and where appropriate the Safeguarding Investigations Unit. Reports should be produced in accordance with the Sussex Police forensic medical examination record. The timing of a letter from the paediatrician to parents should be determined in consultation with Children's Social Care and the Safeguarding Investigations Unit. Consider the ability of parents and wider family and social networks to safeguard and promote the child's welfare. Where the child's circumstances are about to change, the assessment must include the safety of the new environment e.g. if a child is to be discharged from hospital, the assessment must have established the safety of the home environment and implemented any support plan required to meet the child's needs. At the completion of the Section 47 Enquiry, a Strategy Discussion should share information, agree the outcome of the enquiry or plan any further enquiries and ensure all parties are clear about the final outcome. Outcomes of Section 47 Enquiries must be clearly recorded by the Lead Social Worker, with the reasons for decisions clearly stated and signed off by her/his manager on the Record of Section 47 Enquiries. The chronology at the front of the file is up-to-date. Substantiated and the child is judged to be at continuing risk of Significant Harm. Where the concerns are substantiated, but the child is not judged at continuing risk of Significant Harm, this decision must be endorsed by a suitably experienced and qualified social work manager. In these circumstances, consideration must be given to the completion of the Child and Family Assessment (if incomplete), provision of services and/or any future monitoring by agencies (including through the Early Help Plan). If Children's Social Care continues to provide services to the child / family, a Child's Plan should be initiated and reviewed on a regular basis against agreed objectives. Where concerns are substantiated and the child is assessed to be at continuing risk of Significant Harm, the authorised manager must authorise the convening of an Initial Child Protection Conference. The manager may also agree / decide to initiate legal action. Parents, children (depending on level of understanding), professionals and other agencies that have had significant involvement should be provided with written feedback of the outcome of the Section 47 Enquiry (in a letter for the family and in an appropriate format for professionals). Feedback about outcomes should be provided to referrers who are members of the public, in a manner that respects the confidentiality and welfare of the child. If there are ongoing criminal investigations, the content of the Lead Social Worker's feedback should be agreed with the Safeguarding Investigations Unit. Professionals and agencies involved with the child and the family have a right to request that Children's Social Care convene a Child Protection Conference if they have serious concerns that the child's welfare may not be adequately safeguarded. Any such request that is supported by a senior manager or a named or designated professional should normally be agreed. Where differences of views remain then the Resolution of Professional Disagreements Procedure should be followed. The initial Strategy Discussion instigates the Section 47 Enquiry. The Child and Family Assessment must be completed within 45 working days from the date of the Strategy Discussion/Meeting. The maximum period from the Strategy Discussion to the date of the Initial Child Protection Conference is 15 working days, which means that initial conferences may be held prior to the completion of the Child and Family Assessment. Where more than one Strategy Discussion is held, the period of 15 working days starts from the Strategy Discussion that initiated the Section 47 Enquiry. The time-scales above are the minimum standards required by Working Together to Safeguard Children. Where the welfare of the child requires shorter time-scales, these must be achieved. Complex cases e.g. Fabricated or Induced Illness, those involving suspected organised or institutional abuse, cases where paid or voluntary carers are involved and cases which require co-ordination with other local authorities because the child is found outside the borough. Any proposal to justify variation of routine time scales must be agreed by the authorised manager following line manager's consultations with the Safeguarding Investigations Unit and any relevant agencies. Reasons for diverging from statutory time-scales must be fully recorded together with a plan of action detailing alternative arrangements. A full written record must be completed by each agency involved in a Section 47 Enquiry, using the required agency pro-formas, (legibly) signed and dated by the staff or inputted into their electronic record. The responsible manager must authorise Children's Social Care Section 47 recording and forms. Practitioners should wherever possible, retain signed and dated rough notes until the completion of anticipated legal proceedings. At the completion of the Section 47 Enquiry the social work manager should ensure that the concern and outcome have been entered on a chronology kept at the front of each file / on the electronic record. This page is correct as printed on Tuesday 23rd of April 2019 03:37:18 PM please refer back to this website (https://sussexchildprotection.procedures.org.uk) for updates.